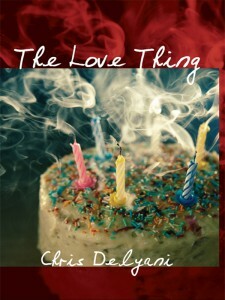 Greg’s first stab at cakemaking is a génoise, “that all-purpose work horse for layer cakes, petits fours, jelly rolls, cup cakes, and so forth,” as Julia Child puts it in her slim volume “Julia’s Kitchen Wisdom.” No doubt Greg skimmed over Julia’s introduction, in which she informs readers that the cookbook is “aimed at those who are tolerably familiar with culinary language … and who know their way around the stove reasonably well.” Like me when I first tried making this cake, Greg gets fooled by the swiftness of Julia’s writing style: “At once, rapidly sift on and fold in a quarter of the flour, then half the rest of the flour, and finally the last of it. Fold a large plop of this cake batter into the clarified butter, then fold the butter-batter back into the remaining batter.” Got that? But the results are oh, so good. The peach upside-down cake of Deborah Madison’s vegetarian cookbook was the inspiration for Greg’s own peach upside-down cake to bring to the office (Chapter Eleven, “What’s Fair,” p. 117), except that Greg uses walnuts instead of Deborah’s suggested pecans. I attempted the recipe exactly once to get a feel for peeling peaches (not fun). Still, several of her recipes are in regular rotation at my house, including her honey-mustard carrots, her fettuccine with bell peppers and parsley, and her Swiss chard omelet known as trouchia. I regularly consult this cookbook whenever I need a non-chocolate dessert for company; her recipe for prune-almond-custard tart, which I almost had Greg make for the office, permanently changed my attitude about prunes. I relied on a number of sources for Greg’s version of the Lady Baltimore cake but found myself returning again and again to Gourmet magazine’s version in its 60th anniversary cookbook, one of my all-time favorites. I didn’t dare attempt the Lady Baltimore myself—it wasn’t by accident that I had Greg describe it at one point as an Everest of a cake. (The génoise is merely base camp.) But there are many other recipes that are far more accessible. The introductions to each of the more than 1,000 recipes are museum-worthy pieces of writing; the results of nearly every recipe I have ever attempted in it (especially the pasta with asparagus) have been outstanding. 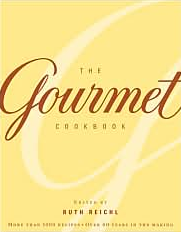 Like the other authors on this page, chef Judy Rodgers doesn’t talk down to readers in her masterpiece, “The Zuni Café Cookbook”: she treats them as equals. I have consulted this cookbook so many times by now that I almost don’t have to consult it anymore—her lessons, from how to prepare beans to how to roast a chicken, are ingrained in me. Her biscotti, on which Greg’s own biscotti are loosely based, are easy to make and a sure crowd-pleaser. 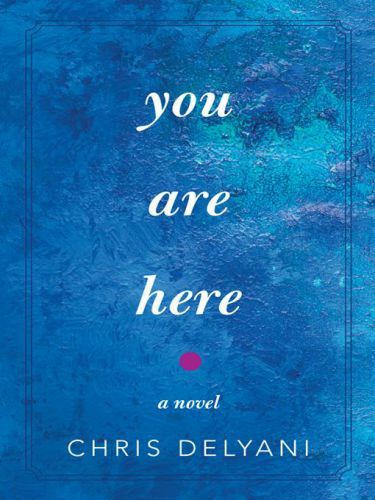 I say loosely because Greg couldn’t have consulted this cookbook to make his biscotti, as “The Zuni Café Cookbook” was published in 2002—two years after the novel’s imagined action. When I need a non-chocolate dessert, I consult Deborah Madison. 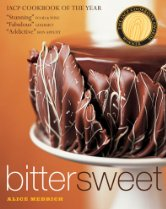 When I need a chocolate dessert, I consult Alice Medrich’s “Bittersweet,” whose recipe for chocolate cheesecake is the inspiration for Greg’s own chocolate cheesecake in Chapter 26, “All This Darkness.” I don’t often make recipes from “Bittersweet”—if I did, I’d bloat up like a tick—so when I do, it’s a cause for celebration. Her recipe for brownies is definitive, while her unusual recipe for tiger cake (which calls for olive oil instead of butter and a dash of white pepper) produces outstanding results. 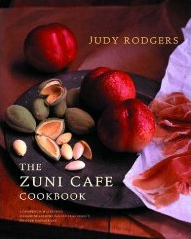 Like “The Zuni Café Cookbook,” “Bittersweet” is an anachronism: it was published in 2003. Got a favorite cookbook or a kitchen disaster you’d like to share? E-mail me.